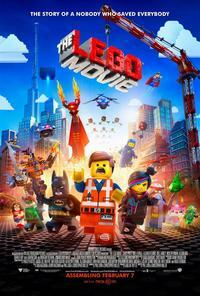 The Lego Movie is the latest in a series of Hollywood films based on children’s toys. Based on this information, one could be forgiven in assuming that The Lego Movie is nothing but a soulless product only produced in order to advertise and sell more products. However, that The Lego Movie is written and directed by Phil Lord and Chris Miller - the duo behind Cloudy With a Chance of Meatballs (2009), 21 Jump Street (2012), and off-beat cartoon series Clone High (2002-3) - restores a little faith. With Cloudy and 21 Jump Street Lord and Miller established themselves as being able to take projects that could have otherwise been a bit rubbish (whether an adaptation of a short children’s picture book or a remake of a 1980s teen series that is only notable for giving Johnny Depp his career) and turn them into two of the most pleasurable and surprising comedy films of the last five years. In this regard, The Lego Movie does not disappoint. The Lego Movie takes place within a world entirely built of Lego. The detail is astounding, as no piece features in the film that does not exist in reality, and it is all brought to life with a seamless combination of CG and stop-motion animation. Even the water is Lego. The ‘star’ of the film is a nondescript construction-worker Lego man named Emmett (Chris Pratt), who goes about his life singing about how awesome everything is and happily following ‘the instructions’ enforced by President Business (Will Ferrell), blissfully unaware of the dark undercurrent of his society and the fact that no one likes him. Everything is about to get even less awesome, as President Business has a plan to make life in the Lego world even more rigid than it already is, using a mysterious weapon known as ‘The Kragle’. One day, Emmett stumbles across the Piece of Resistance, an object which can foil President Business’ plan, and meets a secret society of ‘master builders’ - effectively Jedi warriors of the Lego universe - who believe that Emmett is a prophecy-fulfilling individual known as ‘The Special’. Emmett teams up with these characters, including an old, blind, not-so-wise man (Morgan Freeman), a counter-cultural girl named Wyldstyle (Elizabeth Banks), and her boyfriend Batman (Will Arnett) - yes, the Batman - in order to stop President Business and restore freedom and creativity to the Lego world. There is nothing about the plot description that sounds particularly innovative, and on the surface, The Lego Movie might seem like a run-of-the-mill, shameless, corporate cash-grab. In other hands it might have been, just like Battleship (2012) and the Transformers series (2007-): movies that are based on kids’ toys, but forgo exploring what actually makes those toys cherished in favour of 9/11 imagery-evoking explosions and voyeuristic shots of Megan Fox’s behind, making it difficult to call them kids’ movies. In contrast, Lord and Miller have crafted The Lego Movie with loving, nostalgic, and marvellously creative hands and produced something that perfectly captures the childlike beauty of playing and inventing new things, while also being a glorious pop-culture mash-up that rivals Who Framed Roger Rabbit? (1988) for the number of recognisable characters that can be jammed into one frame (Though not even that film can boast the bizarrely pleasurable contrast of seeing a Teenage Mutant Ninja Turtle and Abraham Lincoln in the same room). That The Lego Movie can give us the best (and yet the silliest and funniest) cinematic interpretation of Batman, be fantastically surprising, and bring a tear to the eye by its end is a testament to how brilliantly it manages to negotiate the fine lines between artistic integrity and product placement, creativity and conformity. There is no doubt that The Lego Movie will leave you wanting to be child again and play with Lego, and that’s kind of the point - but that is not in any way a bad thing. This review was published on March 13, 2014.